Ooh, there’s been some action in the bedroom (sorry, couldn’t resist). Clara’s cot is out, and 90% of the mess is gone. Maternity clothes went into a vacuum bag and stored, and an Ikea bag full of things went to the Salvos. I think I need to create a GIF every time I clean – such a sense of achievement! The next area under attack is my bedside. I currently have a chest of drawers there, but the area is a bit of a dumping ground. It needs to be cleared up and organised, but I want that whole area to be prettier. 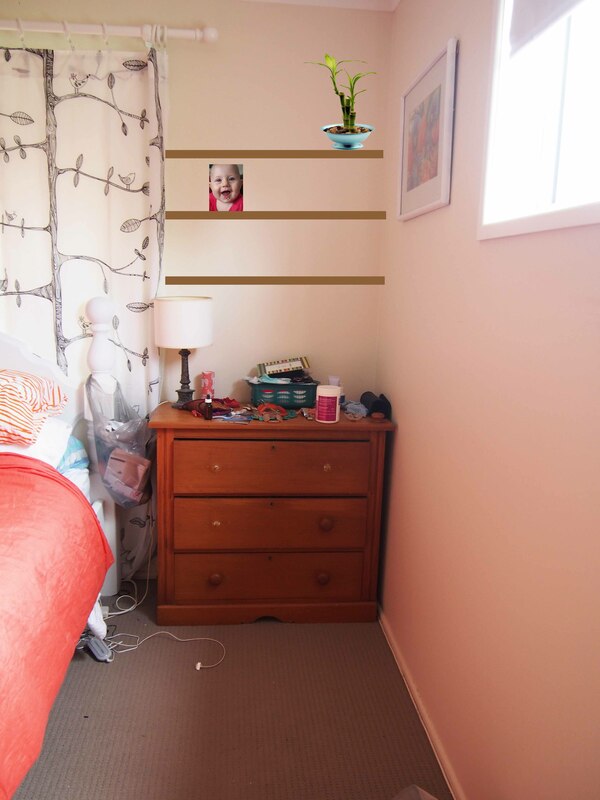 My plan, hideously rendered below, is to add three shelves, then use them to help organise the things that live on the chest of drawers, such as photos, books, and jewellery. Possibly the worst rendering of a plan ever. I guess I can only get better? I have a new lamp ready to go, the timber and brackets for the shelves are bought, and I have a pot just waiting for the right plant. I just need to decide how to finish the shelves (Paint? Stain? Just estapol? ), and install. Maybe a weekend job? If a GIF is getting it fixed can you do it to my garden?